I’m so excited! 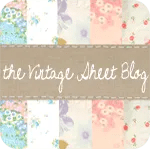 My upcycled pillowcase book pocket tutorial that I originally wrote for Stumbles & Stitches‘s awesome blog & Feather Your Nest project has just been featured on The Vintage Sheet Blog! Hence the new blog candy (aka, “Featured on” button in my sidebar.) Please check it out here!